« Vuze opens up platform; claims 10 million "viewers"
What if the Google phone isn’t a phone at all? What if Google just made a mobile operating system that allowed the search giant to bring its online advertising to the cellphone, that extended the use of its mobile applications like Search and Google Maps, and that delivered Google desktop applications and services to any handset? The New York Times today published a story that said Google hopes to “persuade wireless carriers and mobile phone makers to offer phones based on its software.” At the core will be a Google mobile operating system that is expected to be based on open-source Linux software. It is unlikely that Google will manufacture the phone itself, according to analysts interviewed by The Times. In other words, Google may not be preparing a physical phone to rival Apple’s iPhone or the other smartphones on the market. Rather, Google apparently is developing an alternative mobile OS to Microsoft’s Windows Mobile, which is built into phones from many manufacturers, and the Symbian operating system, used primarily by Nokia and Sony Ericsson. Can a Google Mobile OS compete with Windows Mobile and the Symbian OS? That’s one way to look at it. A Google attack on the open-source front. Others, however, believe that in addition to a Google Mobile OS phone, Google also wants to loosen control of the mobile carriers, especially in the United States, over the software and services that are available on their networks. Google is even contemplating a bid for a piece of the 700 MHz wireless spectrum that’s up for auction in January by the U.S. Federal Communications Commission. Google has been lobbying, with some success, that the mobile Internet should be free of network control. At the end of July, the FCC voted for “open access” provisions, allowing customers to use whatever phone and software they wanted on one-third of the network spectrum to be auctioned. That phone could be an actual Google phone, running the Google Mobile OS on hardware designed for it, or the software just might be the Google Mobile OS. Verizon Wireless and AT&T continue to fight “open access” and are likely to give Google a cool reception. Verizon and AT&T have spent billions of dollars building and upgrading their networks and they want their investments to pay off, and one way to do so is through mobile advertising. Either an actual Google phone, or phones running the Google Mobile OS, are considered competition because they seek the same ad revenue. 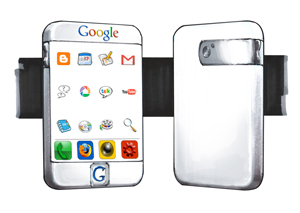 If the Google phone is actually just a mobile operating system, what can we expect? One outcome, which is not preferred, is a repeat of the Windows Mobile mess. 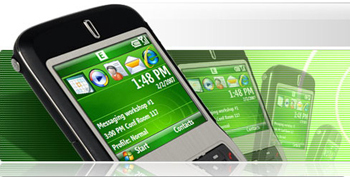 The Microsoft mobile operating system is implemented nicely on some phones such as the Treo but not as well on others. That’s not necessarily Microsoft’s fault: It does not control the hardware, the manufacturers and carriers do. Even so, poor design and hardware implementation does affect the Windows Mobile experience. In tandem with the phone it’s on, Windows Mobile is hard to use, navigate, and set up, among many other problems. That may be, in part, why only 12 million smartphones will be sold this year based on Windows Mobile. That’s just 10 percent of the market, according to IDC, a number that seems low considering that Microsoft has distribution agreements with 48 handset manufacturers and 160 carriers around the world. Another outcome is some level of resistance from carriers like Verizon Wireless and AT&T, who will be reluctant to carry a phone with Google Mobile OS because it will be in direct competition with the phones the carriers offer and the software and services that run on their networks. If Google were to offer an actual Gphone, based on hardware it (or, most likely, a partner) designs and it (again, another partner) manufacturers, it might have a better chance of success as the phone will be designed specifically for the Google Mobile OS. Apple is an example where hardware and software designed together works. Apple tightly controls its iPhone, which runs versions of the OS X operating system and Safari browser. The strategy has earned Apple praise for the operating system, user interface, stylish design but loud criticism for a closed platform. Many analysts, however, believe that despite the closed platform the iPhone has changed customer expectations of their cell phones. Couple that with new consumer desire to interact with social networks, read social media, access mobile services, and access the information that’s important to them, and suddenly you’ve got an iPhone or Google phone designed specifically to meet those needs. In a recent report by The Kelsey Group and ConStat, nearly 45 percent of U.S. mobile phone users say that Internet capability will be a key factor in their next mobile phone purchase. Additionally, the Mobile Market View study also notes that maps and local commercial search are preferred Internet applications for mobile users. The iPhone may be a factor for the rising interest in mobile Internet in the U.S. The iPhone, however, won’t be able to change the face of the U.S. wireless industry alone. That may be left to Google, no matter what form it takes. Nice post. I have started a series with a similar thought process. Here is the first part. If it’s a “true” Linux kernal, then capabilities of the phone should never be a issue of any kind as long as the phone has sufficient memory and processor. Want video? Install an application. Want chat? Install a application. Want chat on many services (AOL, MSN, GChat, etc.) install a app. Movies, install a app. Word processor or spreadsheet? Install a app. If you can do it on your computer, then you’ll be able to do it on your gphone if it’s got the processor and memory (assuming a “true” Linux kernal). I only have 2 questions for this phone. Will it have a true Linux kernal and will it have enough processor and memory (with the ability to upgrade the memory/disk storage) to put the Linux OS to use and gain it’s full potential. Most internet servers run under Linux, many government offices and many small and large corporations run Linux. The OS has more than enough power to do anything you want. Will the phone have the power to use the OS? Google NEEDS to set a minimum “system requirement” to use the Google OS. I went into the t-mobile store yesterday to take a peek at it and I just wasn’t impressed. I’ll admit I’m hard to please though, I’ll stick with my black berry for now.